Amazing photos!! How beautiful is the one from Glass bottom Boat & the one at the book signing. Stunning!!!! Peter, this new batch of photos is wonderful. I love the GBB photo, and the book signing shot in particular. PS - the "Teacher's Pet" shot is Doris with Marion Ross whose best known role is that of Marion Cunningham on the ABC Television sitcom, "Happy Days." Thanks Ania for the interesting Doris photos. The first one looks like it is from Midnight Lace. 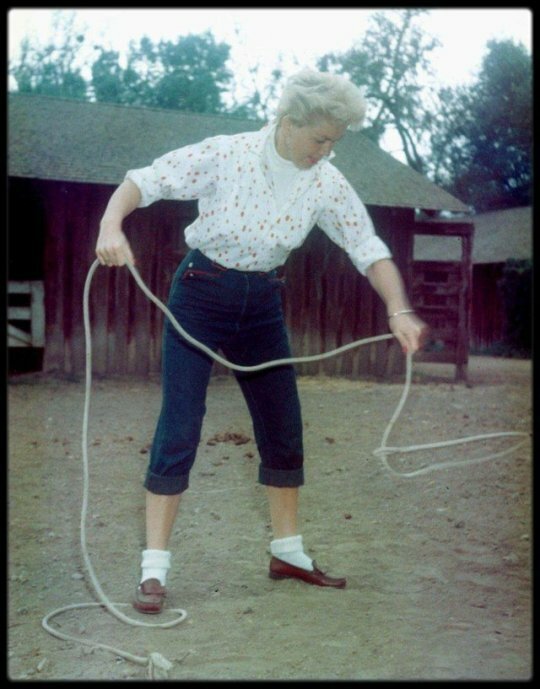 The other two photos of Doris with rope looks like she is practicing lassoing for Calamity Jane.These photos are new to me. Thank you clarabixby for the information. 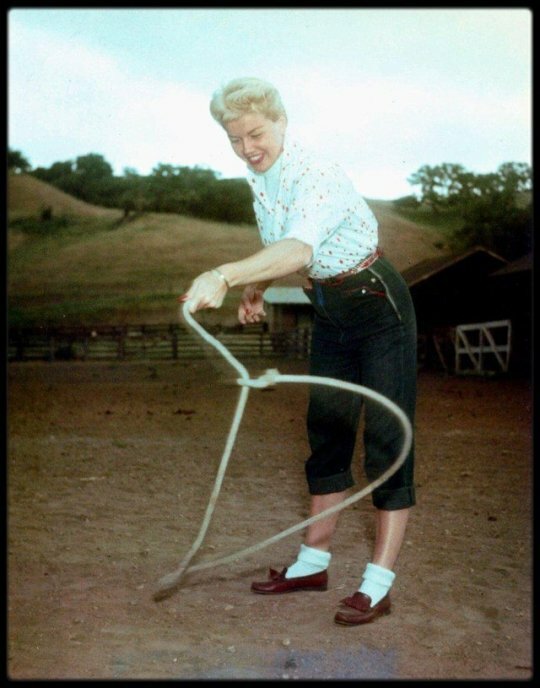 I had read in David Kaufman's book on Doris that in preparation for Calamity Jane, she had gone to a ranch to practice roping and riding. This was much earlier than the family visit to the ranch in California. Thank you for the great photos. 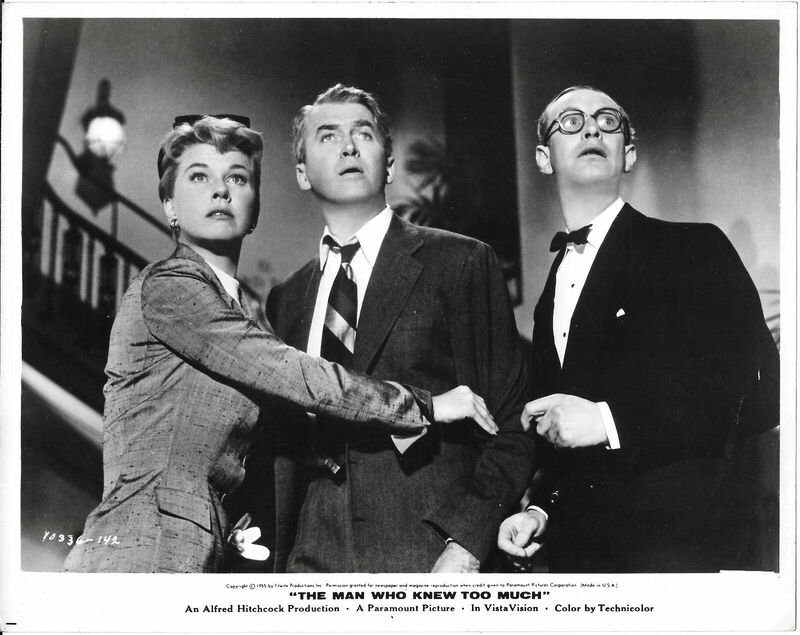 1956 The Man Who Knew Too Much - Doris Day, James Stewart a.o. I always thought so too, but in Doris’ book, Doris Day’s Best Friends, she is photographed with the horse and that was the date and place given. The photo in question is one of the ones above. Also, I feel like I should have said a while ago, my name is Amy. Great photos, Amy, thank you. If you want me to make an avatar for you just send me an image. Love that last one from The Man Who Knew Too Much, Peter! Thanks Peter for the 1948 fascinating John Florea photos of Doris. It is such an interesting study on Doris so early in her film career. Doris always looks so radiant when she is photographed with her beautiful dogs. Thank you for your reply's! The 1952 photo of Doris on the USS Juneau with the sailor is wonderful and new to me. Thanks you for your reply, these Juneau photo's are online too, you can google them. 1956 Julie - Louis Jourdan, Doris Day & Jack Kelly? Peter, your ability to find DD photos is amazing. The one from "Julie" that you posted earlier today got me to wondering about the actor, Ed Hinton, who portrayed the pilot in that film. Ironically, he died 2 years later in a small plane crash (he was a passenger). 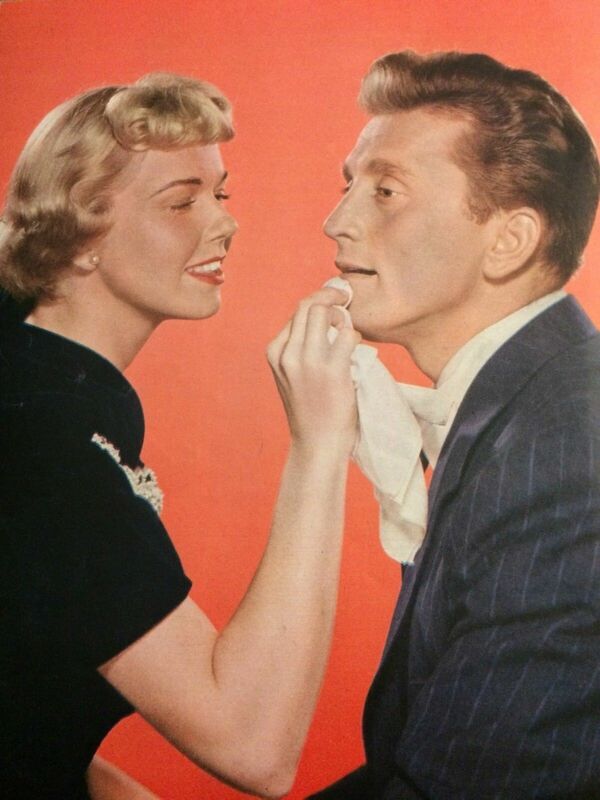 He was a bit player in 2 previous DD movies, "By the Light of the Silvery Moon" and "Calamity Jane." Thanks Peter for all the Doris photos with the supporting players who have familiar faces but with names that don't always come quickly to mind. (Richard Wattis, Jack Kelly, Barbara Hershey, Richard Steele, Jimmy Bracken, and John Findlater. Each of these actors bring a sparkle to the film and deserve recognition. Thanks Musiclover for the background information on Ed Hinton in Julie. Thank you both for your nice reply's. Love that background information Judy!!! Speaking of Barbara Hershey, she recorded a lovely message about working with Doris that was played at this year's DDAF Birthday event in Carmel. She spoke highly of Doris and lauded her dedication to animal welfare. Her message was a heartwarming surprise. This is the first photo in the new 2019 calendar. Isn’t it stunning? 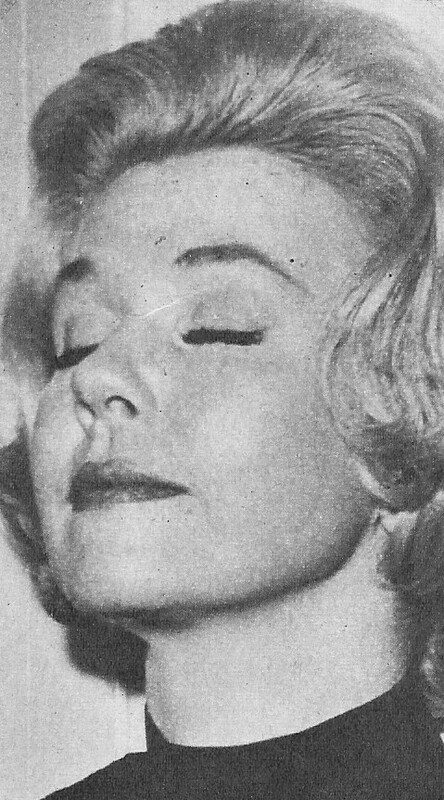 Doris looks radiant in this photo. Yes Amy - This photo is stunning. Haven't received my calendar yet. Hope they are all this spectacular. Haven't seen this photo before. Thanks for posting!